FringePop: The Return of DRAC-ULA--Muaaaaaaaaaah! Most of our vintage movie posters are sexploitation and juvenile delinquent. 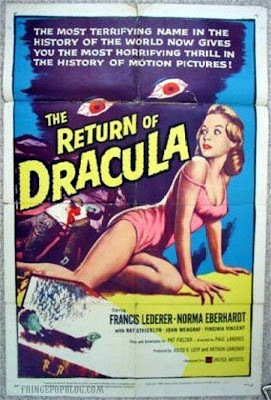 We have a few horror, though, and "Return of Dracula" just may be the cornerstone of our horror poster collection. What more could you ask for...blood sucking vampire (check)...swimsuit clad victim (check)....scary, red eyes (check)....creepy horror font (priceless).